This is a decisive leap from earlier technologies. Laser systems have been attached to Apache helicopters since the 1980s. However, these were generally low-powered and used to guide air-to-ground missiles. Current use of laser technology was similar, with military aircraft using the beams to guide friendly forces to find targets such as bombs or to help missiles hone in on their intended destination. Lasers were never used offensively nor did they display the necessary power to prove effective as such anyway. To be clear, however, Raytheon has never claimed that their new laser technology was a weapon. In their official press reports, the defense contractor has merely stated that they were simply improving on existing technologies. Their statements further described their test laser to be connected to a multi-spectral targeting system (MTS) which was an advanced form of electro-optical sensor found in many advanced drones such as the Predator and Reaper. Moreover, Raytheon did not include the laser’s wattage (which most military weapons reports reveal at its introduction). 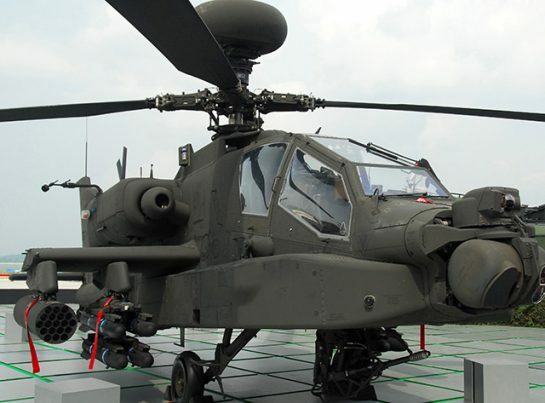 DefenseNews.com has noted that this laser technology could greatly increase the Apache’s firepower. On a typical Apache, each wing pylon can carry up to four Hellfire anti-tank missiles, for a total of 16 missiles. With the new laser technology, an Apache could carry only 12; however, the laser would be more than enough of a compensation. The number of shots the laser could issue out would only be limited by the amount of power it stored. To date, the ability to generate and store power is one of the major roadblocks to laser weaponry. Nevertheless, the U.S. Army is confident that when this challenge is overcome, the cost per shot would prove to be useful in future combat. Matthew Ketner, Branch Chief of the High Energy Laser Controls and Integration Directorate has told the DailyMail.co.uk that Raytheon’s laser could be adjusted for any material, supposedly with a non-lethal option for human targets. The laser is also supposedly silent, making it easier for use in stealth missions. This breakthrough is just the latest in efforts by the U.S. military to increase and improve laser technology to improve their current battle strategies.